"The best thing about being me, there's so many of me!" Through magic or super-technology, the main character decides to get a large number of chores done via copying himself. Expect the original to choose all of the fun things to do when assigning chores around. Hilarity Ensues when the copies rebel or degrade, which results in either (1) at least one Evil Twin, or (2) copies continually being made to the point of risking exposing the Masquerade, or at least ruining the main character's reputation. These copies rarely count as persons in and of themselves. See Cloning Blues and Expendable Clone. If they are counted as people, expect Which Me?. Compare with Doppelgänger Spin, "Sorcerer's Apprentice" Plot. Not to be confused with I Am Legion or Collective Identity. May be used in a Doppelgänger Attack. See also Literal Split Personality. The superpower itself is Self-Duplication. An old Seattle Mariners commercial involved the Mariners cloning star player Ken Griffey Junior so that he could play every single baseball position at the same time. Bill Watterson had a storyline like this, where Calvin uses a "duplicator" to make copies of himself, who turn out to be disobedient jerkasses like the original. Eventually he gets fed up with the copies, and turns them into earthworms (but Calvin being Calvin, the clones aren't inclined to complain: they're all "Cool! Let's go gross someone out!"). This story appears in the collection Scientific Progress Goes Boink, which is apparently named after and based on this story. Later, Calvin tried again for similar reasons, this time making a clone of only his "good side". However, when the Good Twin tries to become friends with Susie, the neighborhood girl (with no success whatsoever), Calvin tracks him down and argues with him, and when the duplicate is about to fight him, he spontaneously explodes. Turns out fighting doesn't count as "good". In Past Sins, Nightmare Moon uses this twice, once to infiltrate the Royal Guard and once to Fight off several monsters from the Everfree Forest. 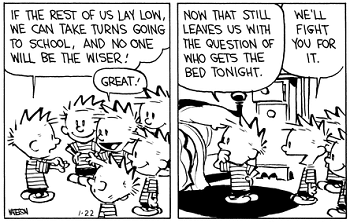 Exploited by Calvin in Calvin and Hobbes: The Series to outsmart Hobbes when the two of them are in a maze. In Unnatural Disaster Taylor eventually learns to do this. In The Infinite Loops, aside from the liberal use of shadow clones, there's the Mikasa glitch which is when a Loop spawns extra copies of the same Looper. Once such a glitched Loop is over the Looper will have the memories of all the copies. Doesn't stop some of them from deciding There Can Only Be One though. There's also "mini-me" Loops, where there's an Awake and an Unawake copy of the same character. Loopers tend to find these very annoying. Princess Luna uses this trick in RainbowDoubleDash's Lunaverse several times, usually to allow herself to go incognito as several normal ponies. Alicorns are capable of creating Avatars of themselves, though of the known one who can play this straight is Luna, who's noted as being exceptionally skilled at making Avatars that can act independently of the original. Celestia can make ones that can act separately of herself, but aren't nearly as good. Queen Libra (Alicorn!Rarity) from Dark World is capable of this flawlessly. This is because Libra is the Concept of the Mortal World, so she's literally the mortal universe itself. Chrysalis can extend her control through her drones, who shapeshift into her and take her form. Though she's only been shown doing this once, and even then had to keep her attention divided between her and the body double. The Scootaloo Army of Awesome is this as they're literally a several thousands strong Badass Army of Scootaloo, most of which are now angels. Not alternate universe versions of her, literally the same exact Scootaloo from different loops of Dark World collected by Nightmare Manacle. Water Aerobics for the Aquaphobic: As a result of falling into the Spring of the Drowned Twins during a disastrous Hogwarts field trip to Jusenkyo, Fred and George are duplicated whenever they're hit by cold water, something they cheerfully exploit for making mayhem. And in the second radio season of The Hitchhiker's Guide to the Galaxy, we have Lintilla . Not to mention Allitnil, Allitnil and Allitnil. Archipelago Exodus' Terrian Brogue has this power. Now that the ability has amplified to duplicating items he's holding on his person as well, he's taken a giant leap forward in terms of versatility and usefulness... and financial value. In Radio City, Multiplayer is capable of creating up to fifteen clones of himself. In Permaneo Spes, this is Antonio's power. In Puella Magi Adfligo Systema, Aki can make magic clones of herself. In Touhou: a Glimmer of an Outside World, Shinto Gods are able to split themselves indefinitely, something Suwako fully takes advantage of. In Resonating Spirits, Nic King has the ability to make a clone puppet of himself. In ZED, Zed starts the story with several doppelgängers. By the time Abraka appears, however, they have been condensed into one being. Makuta Bitil's Mask of Power in BIONICLE allows him to summon past versions of himself to create this effect. His past selves are unable to retain memories of future events, and he is often stricken with random injuries that appear out of nowhere whenever HE get's summoned by a future version of himself. A Legend Of Zelda parody, Four Swords Misadventures, has Dark Link doing this — a lot. The first time, he even used the quote from Agent Smith before showing it off. In the latest episode, he uses this power to go on a one-man riot. A couple of characters in RWBY demonstrate this ability. The first of these was Blake, whose Shadow Semblance allows her to leave a temporary afterimage of herself. Then there was Sun, who showed off the ability to create light copies of himself in Volume 2. After this, there was Flynt Coal, who can split himself into four with his "Killer Quartet" ability. Every character in Back To The Moon (except for Jehanne) is a duplicate of Georges Méliès.